For autophagy studies using fluorescence microscopy. Immunogen: Synthetic peptide corresponding to the N-terminus of human LC3B. Specificity: Recognizes LC3/GABARAP proteins (Atg8 homologues) in both their free (LC3-I) and PE linked (LC3-II) forms. Purity Detail: Purified by size exclusion chromatography. Use/Stability: Stable for at least 1 year after receipt when stored at -20°C. Reagent is light sensitive; store in the dark. The use of high quality ‘antiserum-grade’ plastic or glass vials is recommended. Handling: Protect from light. Avoid freeze/thaw cycles. After opening, prepare aliquots and store at -20°C. Scientific Background: Autophagy is a highly conserved bulk protein degradation pathway responsible for the turnover of long-lived proteins, disposal of damaged organelles, and clearance of aggregate-prone proteins. Autophagy is involved in various physiological or pathological processes, such as development, host defense response, cancer and neuronal degenerative diseases. It involves concerted action of more than 20 specific autophagy (ATG) proteins that mediate the formation of a double-membrane vesicle, the autophagosome, which engulfs the substrate and delivers it to the lysosome for degradation. Formation and expansion of the pre-autophagosomal structure in yeast requires the attachment of the ubiquitin-like protein ATG8 via its C-terminal glycine to the amino group of phosphatidylethanolamine (PE), enabling its anchoring to the isolation membrane of the autophagosome. In mammals, ATG8 is represented by at least seven related proteins that fall into two subgroups, LC3- and GABARAP-like proteins. The free and PE linked versions of these proteins are often referred to as LC3-I and LC3-II respectively. Technical Info/Product Notes: 2G6 antibody was conjugated to fluorescein by a proprietary method. The fluorescein-labelled 2G6 monoclonal antibody (BML-PW1205) facilitates ready detection of LC3/GABARAP proteins in cells by fluorescence microscopy. 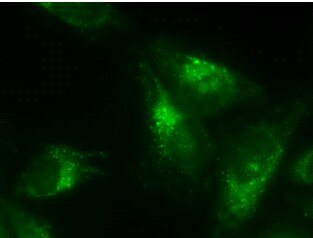 Detection of LC3/GABARAP proteins in HeLa cells by fluorescence microscopy using fluorescein labeled 2G6 mAb (BML-PW1205), at 1:250 dilution. HeLa cells were treated with proteasome inhibitor MG-132 (5µM, BML-PI102) for 12 hours prior to analysis.